Winner of the Bronze Medal for Inspirational/Spiritual Non-Fiction from the Independent Publishers Awards for excellence (IPPY), designated a Winner in the Spirituality category in the Eric Hoffer Awards, and recipient of three medals from the INDIE Next Generation Awards – Spirituality, Christian Non-Fiction, and Best Overall Design. 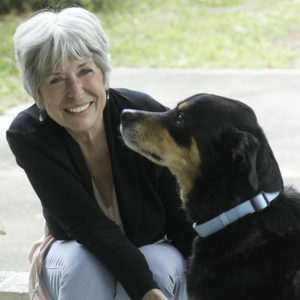 The reader is invited to join author Marti Healy and dogs Sophie and Teddy through trails deep in a woods and over open polo practice fields, during sun-soaked summer mornings and on rain-misted autumn afternoons, pondering tiny pet memorial stones discovered in a once-private garden, and interpreting one dog’s tacit refusal to watch an Easter animal parade. This is a book that concurrently invites you into a conversation of spiritual living and growth. It proposes “what ifs.” It shares personal observations. It gently suggests and describes. But it is you – the voyager, the seeker, the reader along on the walk – who is encouraged to consider and explore and determine your own personal journey. Ideally, of course, in the delightful, wise, and compelling company of dogs. 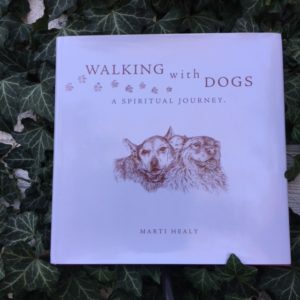 “Here is a beautifully written reminder that God can be found everywhere, especially during the simplest of daily activities – like walking the dog. “Even though the book title invites us on a “spiritual journey,” this is by no means a heavy, ponderous, religious exhortation. 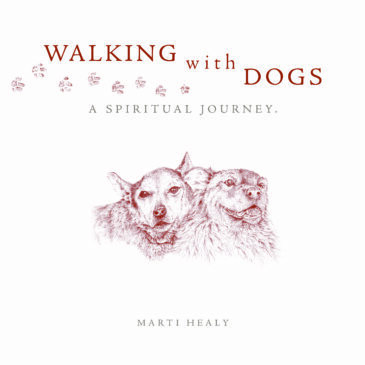 It is as light-hearted as dogs Sophie and Teddy and their human, writer Marti Healy, who shares with us an insightful sense of humor. 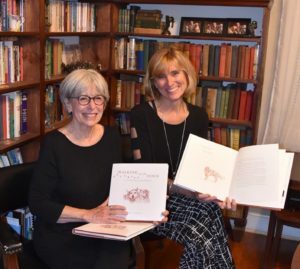 “Beguiled by the easy gait of the dogs as well as the author’s prose, the reader is also enticed by the gentle, sepia-toned illustrations, resulting in a highly readable, intimate book.